One of the most enduring sports logo mysteries involves the Cincinnati Reds' "Mr. Red" that the club utilized from 1968 until 1992. Mr. Red wore the number 27 throughout these years, a golden era which saw the club win five National League pennants. 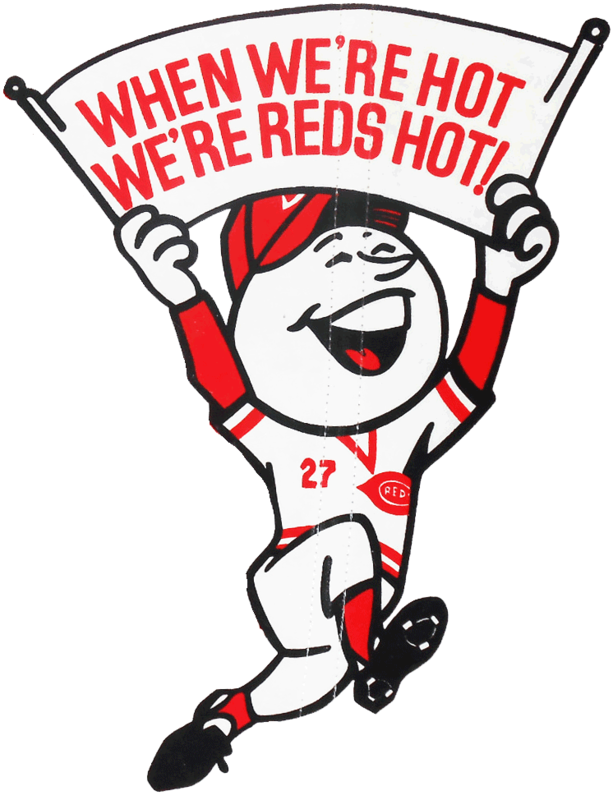 Mr. Red was so closely identified with the number that no Reds player was assigned uniform number 27 from 1968 until 1973. The connection between Mr. Red and uniform number 27 is well known, but has never been explained. The enigma is so deep that no plausible explanation has, to my knowledge, ever even been floated. Now, 46 years later, the mystery of Mr. Red and uniform number 27 has been solved. The Reds' Running Man logo was unveiled in 1968 with the coming of the new team ownership, a large group of local-based partners who pledged to keep the team in Cincinnati after there were rumors of it going elsewhere (they also changed the uniforms from the vests to the early pinstriped version of the "Big Red Machine" unis). Head of the group was Francis Dale, a prominent local businessman and, among other things, the publisher of the Cincinnati Enquirer. Francis Dale's young son was a rabid baseball fan --- his favorite player (as unlikely as it sounds) was Cardinals utility infielder Dal Maxvill, who wore no. 27. 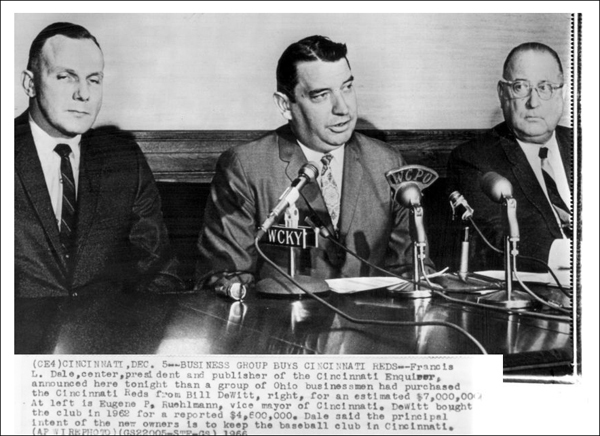 Some additional details—on December 5, 1966, a deal was announced in which Reds owner Bill DeWitt sold the club to a syndicate of Cincinnati businessmen, led by Cincinnati Enquirer publisher Francis L. Dale. The sale of the team was contingent upon an agreement that the city would build a new downtown stadium—later Riverfront Stadium—and that the Reds would commit to a 40-year lease there. The Reds future in Cincinnati was thereby secured after nearly a decade of uncertainty. Beginning in the late 1950s, the club was rumored to be on the move to cities such as Minneapolis, Los Angeles, and New York. Francis Dale was president of the Reds from 1967 to 1973. In addition to his roles with the Reds and the Enquirer, Dale later served as United States representative to the United Nations and as commissioner of the Major Indoor Soccer League. He passed away in 1993. Dal Maxvill was a slick-fielding infielder for the St Louis Cardinals—he saw action in every World Series game for the Cardinals' 1964, 1967, and 1968 pennant winners. He later served as the team's general manager, from 1985 to 1994. Despite a career .217 batting average, Maxvill played 14 seasons in the majors.